L-Tyrosine, Microcrystalline Cellulose, Potato Starch, Anti-caking Agents: Stearic Acid, Magnesium Silicate Prep. & Silicon Dioxide, Tablet Coating: Hydroxypropylmethylcellulose, Propylene Glycol, Ethyl Cellulose, Natural Source Colour (Titanium Dioxide), Dibasic Calcium Phosphate, Polyvinylpyrrolidone, Crosslinked Cellulose Gum, Zinc Sulphate, Ferrous Sulphate, Niacin (as Nicotinamide), Manganese Chloride, Liquid Paraffin, Vitamin B6 (as HCl), Folic Acid (as Pteroylmonoglutamic Acid), Tartaric Acid. TAKE FOUR TABLETS PER DAY WITH A MAIN MEAL. This is best achieved by taking two tablets twice a day (at different times of the day, preferably after lunch and after your evening meal). Swallow with water or a cold drink. Food supplements must not replace a varied and balanced diet and a healthy lifestyle. As with other food supplements, seek professional advice before using if you are pregnant, breast-feeding, under medical supervision, suffer from food allergies, or are allergic to any of the ingredients. This product contains iron, which, if taken in excess, may be harmful to very young children. Do not take this supplement if you have been diagnosed with Hemochromatosis, or the rare disorder Tyrosinosis (Tyrosinemia). Vitamin supplements are not intended to treat or prevent any disease. Why has Dopavite been developed? Can Dopavite be used with medicines simultaneously? How many tablets does one pack of Dopavite contain? How and when should Dopavite be taken? Are there any undesired effects whilst taking Dopavite? Is Dopavite suitable for vegetarians and vegans? Difficulty swallowing tablets is fairly common – do you have any advice? 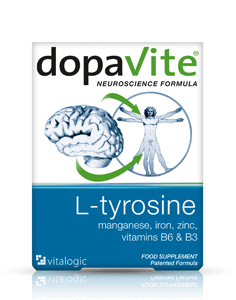 Dopavite has been developed to provide effective levels of specific micronutrients to help support brain function, including zinc and iron which contribute to normal cognitive function, and niacin & vitamin B6 which help maintain the normal functioning of the nervous system. Dopavite is recommended for men and women of all ages who are interested in safeguarding their nervous system and cognitive function. Generally, Dopavite may be used alongside medications because it contains only moderate levels of vitamins and minerals and is free from any drugs or hormones. For specific advice on taking Dopavite with medicines, we recommend that you contact your doctor or pharmacist. Each pack of Dopavite contains 60 tablets. It is recommended to take four tablets per day, so each pack should last 15 days. Take four tablets per day with a main meal. This is best achieved by taking two tablets twice a day (at different times of the day, preferably after lunch and after your evening meal). Swallow with water or a cold drink, without chewing. Taking the tablets with a main meal maximises the absorption of the nutrients, and can reduce mild nausea, which is sometimes experienced if multivitamins are taken on an empty stomach. Dopavite should only be taken on a full stomach. Always ensure that Dopavite is taken with a cold drink to wash the tablets down, and not tea or coffee, as hot drinks may cause the tablets to disintegrate too early. Dopavite has no known side effects when taken as directed. Do not exceed the recommended dose. In case of overdose, seek medical advice. The full benefits of Dopavite may take place over several months, so a regular intake is advised, taking the full recommended amount every day. Not recommended for children. Do not exceed the recommended tablet intake. Dopavite is suitable for vegetarians, and has not been tested on animals. Unfortunately, Dopavite is not suitable for vegans. Difficulty in swallowing tablets is quite a common experience. Vitabiotics have researched this extensively, trying different methods, and hope that our tips will help you swallow tablets with ease. The usual advice for those who have difficulty in swallowing tablets is to break the tablets into 2-3 pieces, before swallowing with plenty of liquid. In cases where people have more difficulty in swallowing tablets we recommend after chewing some food (e.g. banana), just before you swallow, pop the tablet into your mouth and swallow it together with the chewed food, followed by some liquid. The throat opens up wider automatically to swallow the chewed food and hence the tablet should go down with greater ease. Alternatively the tablets may be swallowed with thicker liquids such as yoghurts or smoothies. We hope these tips are of help.